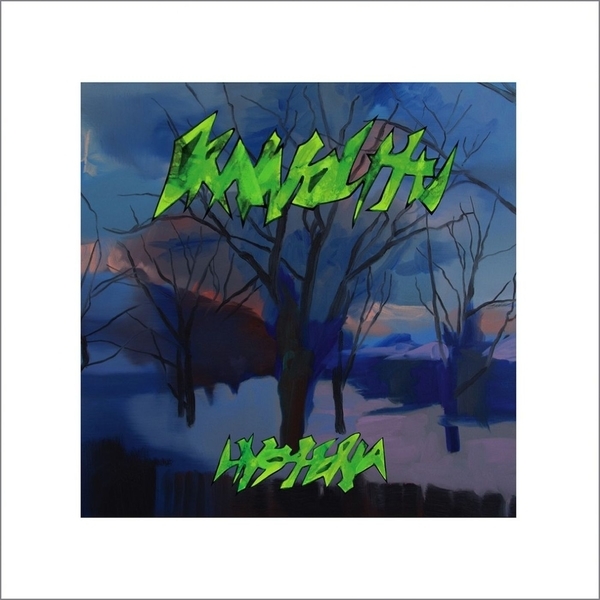 "“Hysteria” is the result of nearly two years spent in various studios with producers and fellow ‘Boone brothers Nate Young (Wolf Eyes) and Neil Hagerty (Royal Trux), working diligently together to take a few steps beyond Trip Metal and extract the skeleton out of “rock”, inserting it into a newer, much weirder, humanoid skin. The epicenter of this sound rests humbly on the foundation of guitar and voice, two facets of sound that Moskos has carefully cultivated through years of experimentation and digestion from a wide array of musical influences. The relaxed, loose, and energetically electric technique of guitar playing is reinforced by Drainolith’s unrivaled tone, which has morphed throughout the years but now stands alone atop a mountain of shredders. It is ripe with Bluesy fuzziness and the humanity of Americana, while punctuated by the gritty stab of 80’s death metal, and further rounded out with a sprinkling of EVH-esque chorus zones and free jazz adventurousness. The result is a sound that pre-dates the internet in a fabulous way. Each note seems to leave behind a glistening impression like a spot of grease on a pizza box. A tone as unique as this is only bolstered by the vocal delivery, the literal voice of the Mind of Moskos. This beautifully cold, dripping baritone is unmistakable, it’s fried-yet-poetic articulation recalling a halfway point between a melting Dylan and a blazed Robert Ashley. Over-tired, over-wired, and over it. Moskos lets every word kerplunk into a mesmerizing puddle of observation, giving something as mundane as staring out the window or a Vancouver hotel foyer the poignancy of a published work."